Introduced in Recipe for Disaster, this Dungeon plays a major role in that Quest. In part 8 you need to get the Evil Chickens' Egg. Well, this is his home. There are quite a few options for getting here. The most versatile being the Fairy Ring network available after getting to a certain point in the Fairy Tale Part II: Cure a Queen quest. After you can use Fairy Rings, you can use any of them to go to Zanaris. 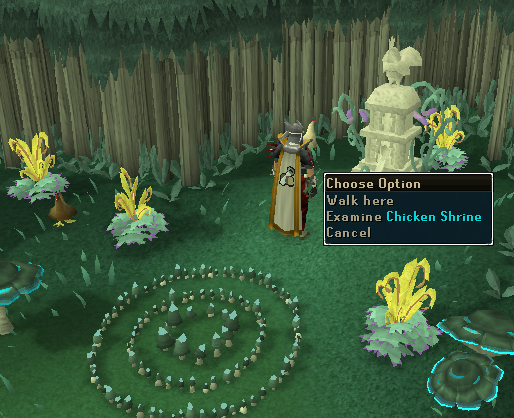 From the main ring, walk northeast to the other Fairy Ring in front of the chicken statue. If you have not completed the Fairy Tale Part III quest, you will need a Dramen or Lunar staff to use fairy rings and to enter Zanaris via the hut in Lumbridge Swamp. After the quest, you will not need those. Using this enchanted Dragonstone amulet, you have the option of teleporting to Draynor Village. 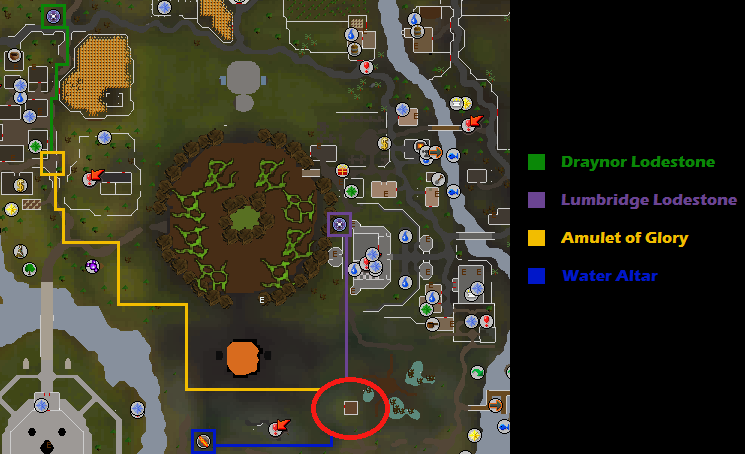 From the landing spot, walk south past the jail then east on the south side of the gate dividing Lumbridge and the swamp until you reach the hut. The Lumbridge Lodestone is automatically unlocked, but you may choose to use the Draynor one if you have it unlocked and find it more convenient. From Lumbridge, walk south past the cemetery and through the gates. Once in the swamp, walk slightly southwest past a small pond. 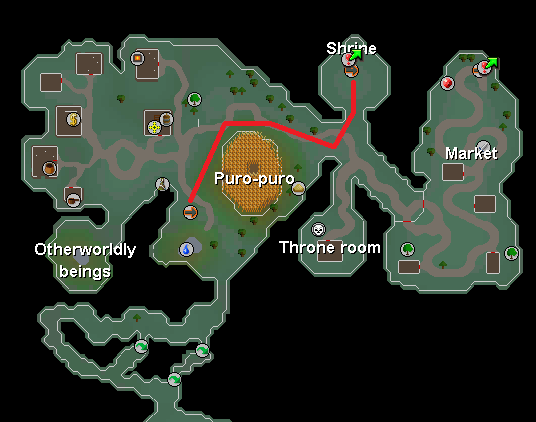 From Draynor, walk south through the city, past the jail, and then east through the swamp past the water altar. If you have unlocked the use of the Abyss, you can use the abyssal entrance to the water altar. Exit the altar and walk a little east to find the hut. To enter the Dungeon use your Raw Chicken with it. If you forgot to bring your raw chicken, there are a few live chickens running around the fairy ring by the shrine that you can kill for their meat. Before entering it is advised to turn on Protect from Melee, wield your anti-dragon shield or Dragonfire shield, and take a sip of anti-fire potion. 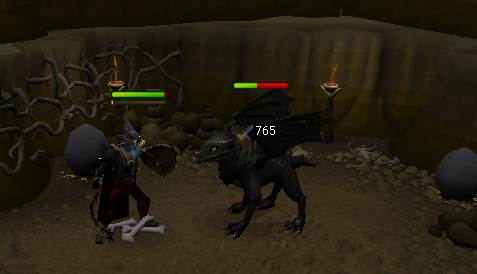 When you first enter the dungeon, you will be met with level 144 Black Dragons. Possible Loot: Always Dragon Bones and Black Dragon Hide. Air, Fire, Death, Blood and Law runes, Steel and Rune arrows, Hard clue scrolls, Left Half Shield, Runite Bar, Draconic Visage, Starved Ancient Effigy. Heading east from the entrance, a path leads to a mining area. Stocked with three gold rocks, three silver rocks, four iron rocks, four coal rocks and finally two mithril rocks. Walking or running back to the central chamber and heading north you enter Evil Chickens' Lair. When finished with Recipe for Disaster the only thing you will find is Evil Chickens' empty nest. The only thing you can do with it is examine it: "A nest of Evil." Turn back south again and you will find an entrance to the next part of the dungeon. 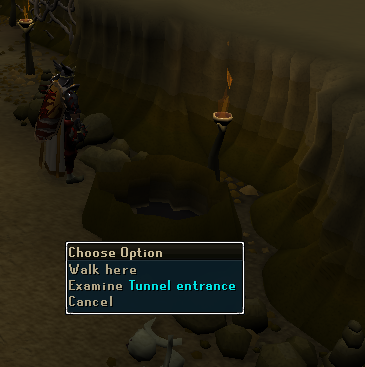 It looks similar to the Kalphite entrance and you will need to use a rope to climb down. Unfortunately you will lose the rope after climbing back out again. If you ever plan on using it, make sure you have a rope every time you enter. 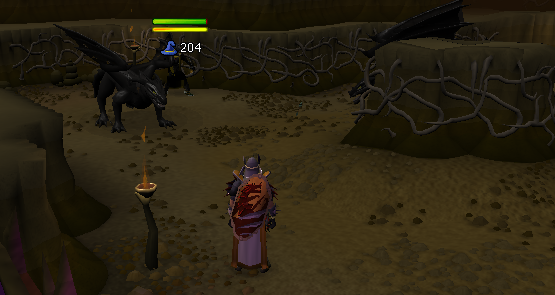 A single Baby Black Dragon is the only creature in here. 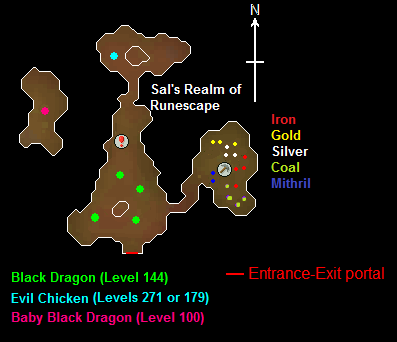 Unless you want to do some mining or Dragon Slaying, in which case the closest bank is in Zanaris, it now is time to climb the rope and head south to the fancy purple portal you entered. Step through it and you will enter the wondrous world of Zanaris. Have fun!